Greetings from frigid Baltimore, as I sit in my hotel room recovering from a day of standing in line on hard concrete, waiting for autographs. Yes, I was at Fan Fest, today, but I will hold off posting about that til I get home tomorrow, because my hotel room is way too small for me to be spreading out all of the stuff I got. I did get, however, another ball for my HOF signed baseball collection. My mom and I were killing time before one of our signings, and decided to check out a vendor who had a bunch of signed baseballs. 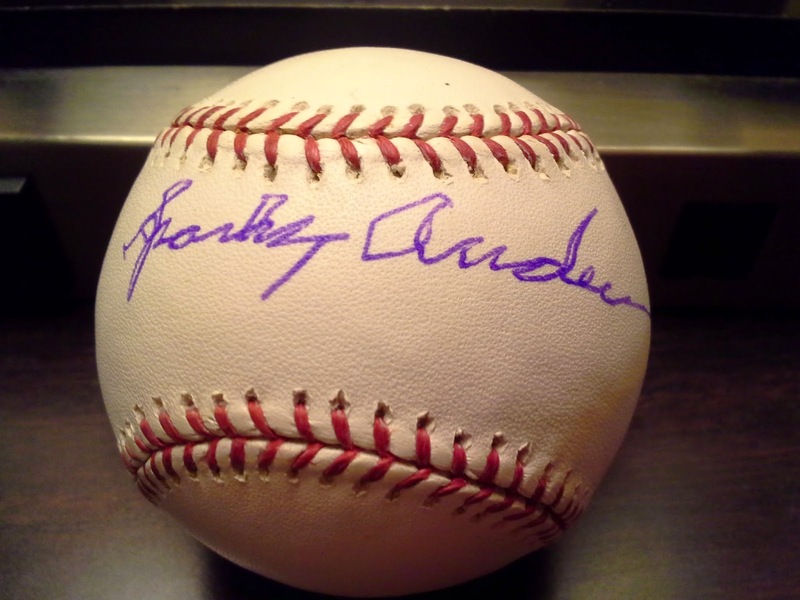 I picked up this Sparky Anderson for only $65.00, which I thought was a great price. He was the only Hall of Famer that I needed that he had for sale. Anderson (b. 1934 - d. 2010) played in the majors in 1959 for the Phillies but is best known as a manager who took the Reds and Tigers to World Series championships. Anderson managed the Reds from 1970 to 1978 and then the Tigers from 1979 to 1995. He won the World Series in 1975 and 1976 with the Big Red Machine and 1984 with the Tigers. He had a career won/loss record of 2,194 - 1,834. As a manager, he compiled 19 full seasons with a winning record. Anderson was elected to the Hall of Fame in 2000 by the Veterans Committee. 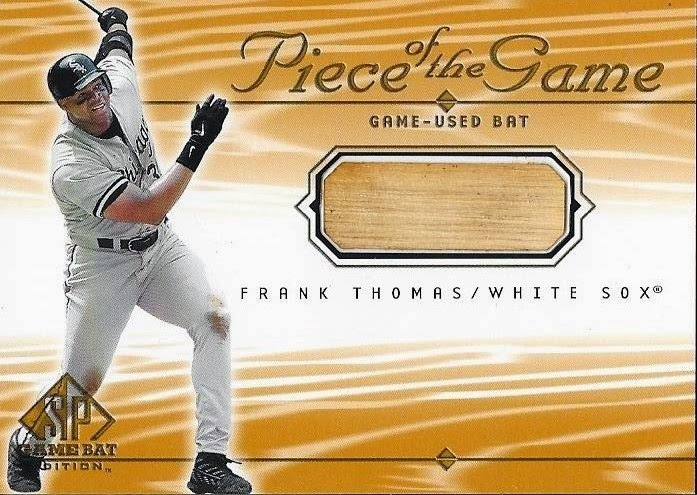 I completed a trade recently with my friend, Caleb, when I sent him a multitude of Braves cards and in return he sent me this nice 2000 Upper Deck SP bat relic of Frank Thomas. This is from the early stages of game used relics, and is a very nice card. I agreed on it pretty fast when Caleb offered it in trade. I wish I could remember what I sent him, I think it was an Evan Gattis card, but I forget. In the package with this card was a few cards that Caleb sent along as a Christmas gift. 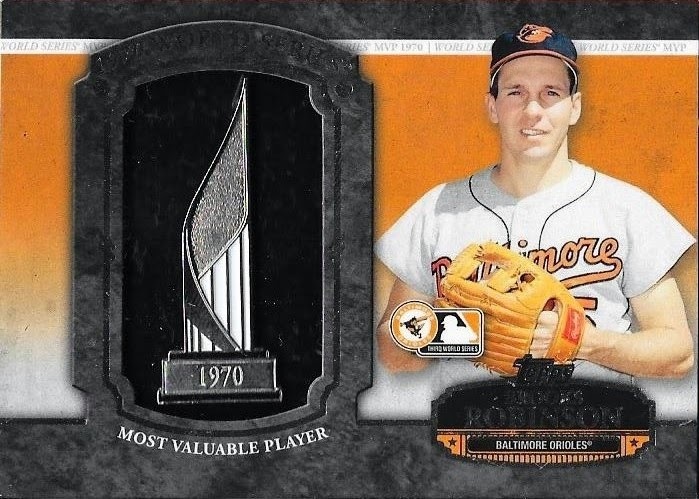 There were a few Orioles parallels in there, along with a diamond parallel from 2011 Topps of Sandy Koufax. That actually wraps up the Christmas gifts that I got, well into January. Thanks for the trade and gifts, Caleb! Christmas Gift From Michael S.
I got a nice Christmas package from my friend, Michael S. recently. It was funny to me, because I apparently have wiped him out of Orioles cards, so he had to dive deep into his collection to be able to send something for Christmas. I would have been happy with just a letter, or a Christmas card, but Michael insisted on sending cards. While they weren't really Orioles (there was a reprint Jim Palmer in there), I was still happy with what he sent. 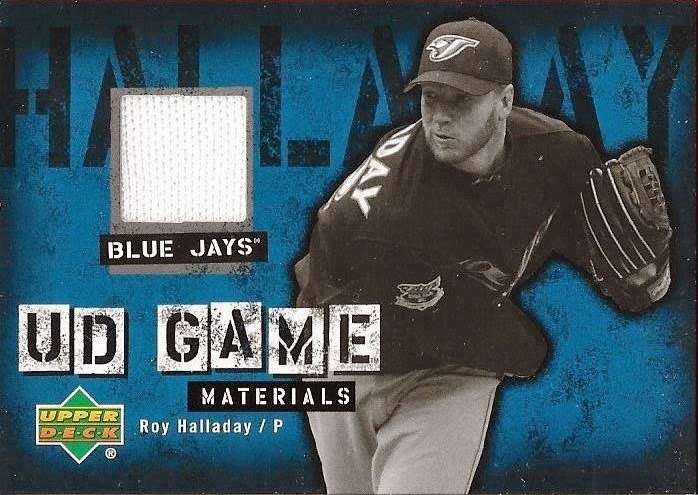 The above Roy Halladay relic card is a really nice one; I like the blue and black background. Michael also sent a 1990 Score Ken Griffey, Jr. which I will hold onto for a while. Thanks for the nice Christmas package, Michael. Again, you didn't have to send anything, but I sincerely appreciate the thought! I got a surprise care package in the other day from a new friend off of Instagram named Bryce. He and I have traded, I think, twice now, and I actually had sent him a care package the same time he sent me one. So, this was almost a blind trade. I sent Bryce a huge stack of Brewers cards that I had put aside for a deal I was working on with another Instagram kid who ended up not sending payment. Instead of putting all of the cards back into my trade box, I just contacted Bryce to see if he would take them, since I knew he was a Brewers fan. Bryce happily accepted, and mentioned that he had assembled an Orioles package to send my way, as well. 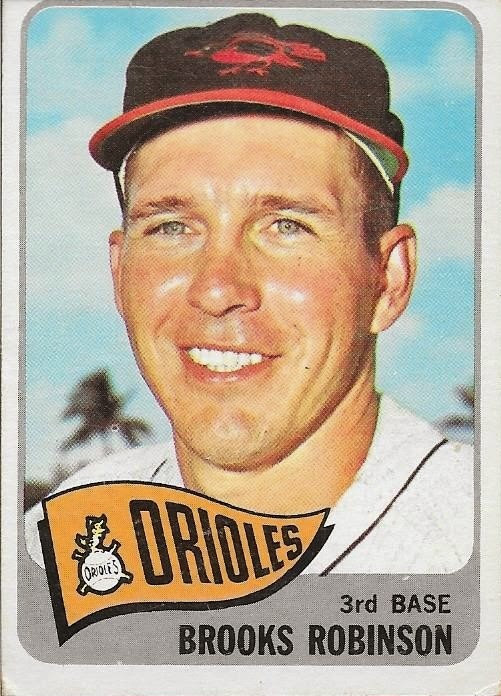 The above 1965 Topps Brooks Robinson was the biggest surprise of all. 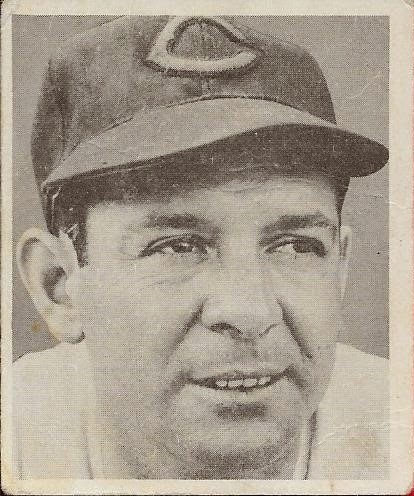 I already owned a Brooks card from '65, but I was more than happy to take another. I really love this design, and who can refuse Brooks vintage cards? Bryce also sent an assortment of color parallels from 2014 Bowman. 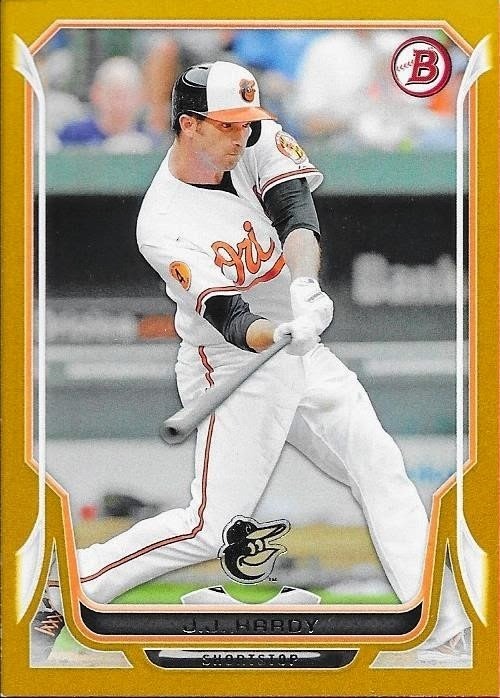 This JJ Hardy gold parallel was especially nice. It is numbered 8/50. 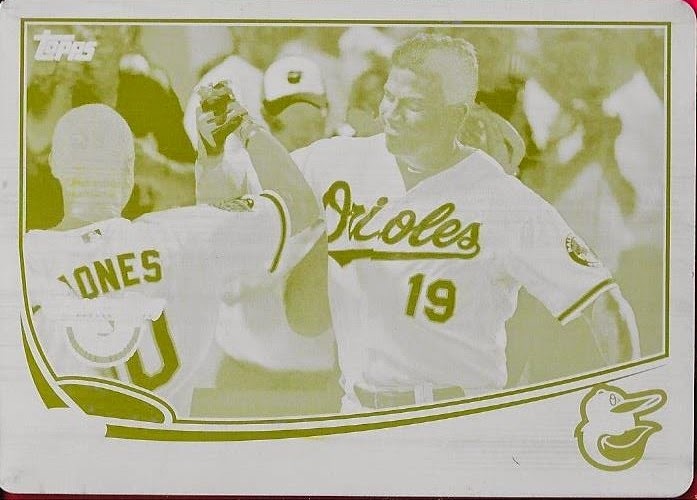 Bryce also included green parallels of Wei-Yin Chen (41/150) and Adam Jones (110/150), as well as orange parallels of Chen (119/250) and Jones (74/250). 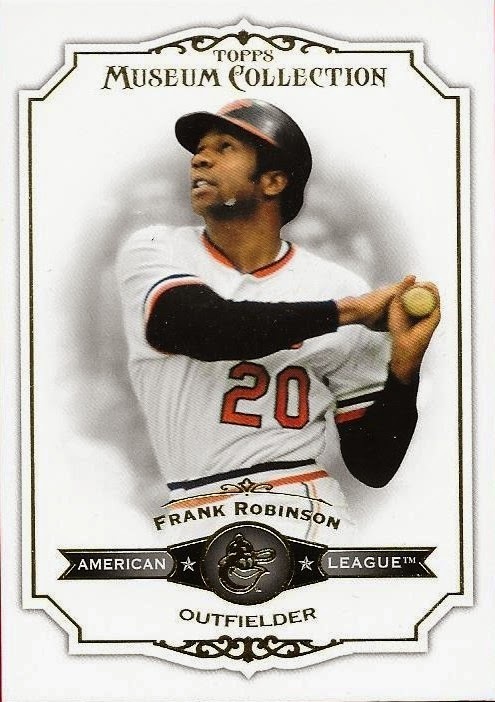 Among an assortment of recent Orioles cards was this 2012 Museum Collection Frank Robinson that Bryce included. I don't have much from Museum Collection prior to 2014, so I will be working toward adding more to my collection. Museum collection always looks great, and I feel like I never have enough cards of Frank represented in my collection. 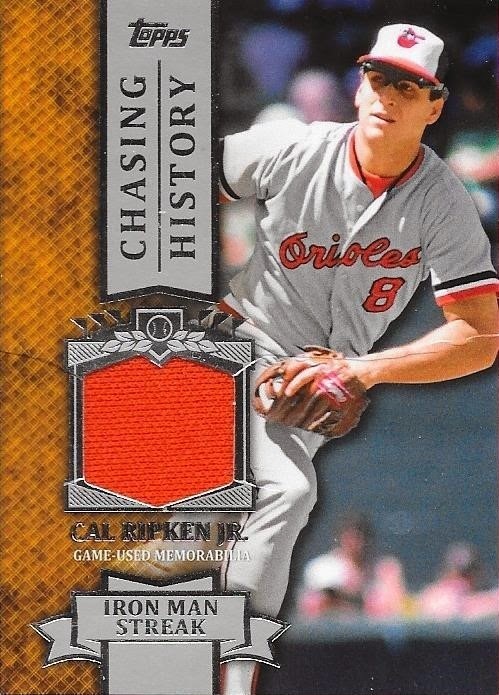 Finally, while I already had one of these, it was really cool to see this Cal Ripken relic included in the package. The card has a big crease running horizontally in the middle of the card. It still does not take away from how nice the card is and how cool it is to have that orange swatch of jersey imbedded in it. What might have been the best part of the package, was how Bryce included a separate envelope for my son, Chris. Inside was an assortment of Giants cards, including what seems like a near complete team set of orange parallels from 2014 Bowman. I love care packages for myself, but when you also include Chris, well, you really win me over (not that Bryce needed to win me over at this point). Thanks so much for the care package, Bryce! I really appreciate it, and I know who I'm going to first when I get any Brewers hits, from now on! I got a sweet Christmas package from my friend, Noah. He really hooked me up in the package, and I wanted to show some of it here. Noah gave me the above Hunter Harvey auto from Bowman Sterling as part of a deal, and included it with the Christmas package. The Christmas stuff was mostly Orioles for my PC, many of them being Cal Ripken cards. Noah is a really awesome guy, and really came through. I sent him a really nice 2014 Museum Collection triple relic auto of Wilin Rosario for his PC. Is it just me or was Museum Collection one of the best products of 2014? Either that or Bowman Chrome. Noah had busted a box of 1991 Score and ended up with quite a few Cals from there and I was the lucky recipient of them. Thanks so much for the 1991 Score Cal Ripkens, Noah. I mean, I already had like 20 of them, but 5 more couldn't hurt, right? Haha. Really, though, thanks for the Christmas package, Noah! I really appreciate it! This card looks familiar, I know. My friend, Trevor showed me this Brooks Robinson and asked if I needed it. I did, since the one I had was damaged. I was happy to upgrade the one I had, and I didn't have to give up much for this. Trevor takes any and all Reds that I have, so it is really easy to trade with him. Thanks for the deal, Trevor! I really appreciate the card, and thanks for helping me replace a damaged card! 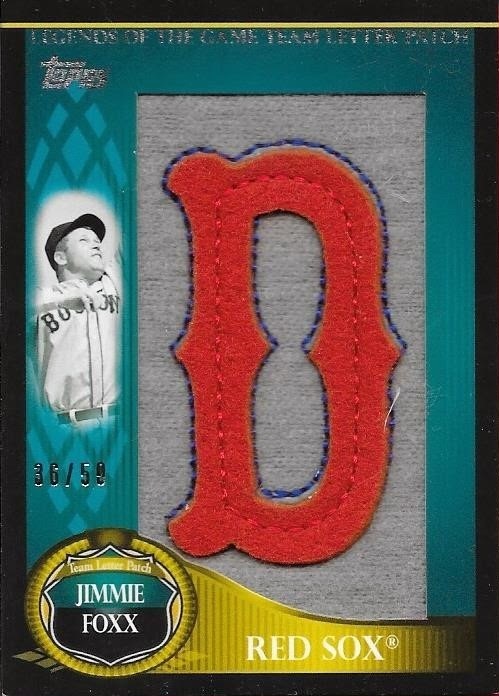 I got a steal off of Instagram recently when I picked up this 2009 Topps Legends of the Game Jimmie Fox letter patch from a guy for $2.00 + shipping. I couldn't pass up the deal. I wish it was the Brooks Robinson letter that I needed but I'm still happy adding this to my Jimmie Foxx PC. By the way, I will NOT be pursuing the set of these. I have learned my lesson with my Brooks patches. Maybe someone will come along with the R that I need. One of these days. 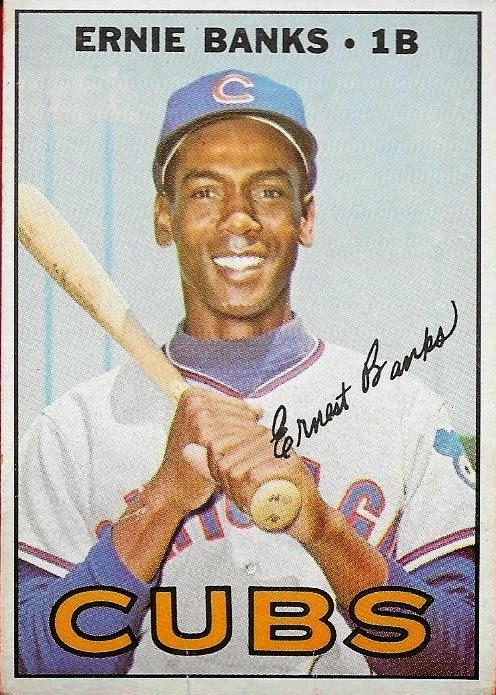 The world lost Ernie Banks last night at the age of 83, just days shy of his 84th birthday. I had talked to my friend, Max a few days ago. He was set to meet Banks at Cubs Fest, but Banks cancelled due to illness. He was upset that he didn't get to meet him, and I was upset for him. My good friend, Drew, met Mr. Banks a few years ago at the White Plains show, and had a memorable time. I know it is something Drew will never forget. Banks was one of my favorite non-Oriole Hall of Famers. You never heard a bad thing about him. He symbolized what is right about baseball. Enjoying playing the game you love, regardless of playing a league record 2,528 games without reaching the post season. I was happy that Banks was one of my biggest TTM successes. It was also really cool that he appeared on stage with Pearl Jam during their concert at Wrigley Field in July 2013. I have my ball signed by Banks which is inscribed "Pearl Jam Rocker - 7/19/13". Also, since Pearl Jam records every concert and makes them available to fans, I have the bootleg saved on my computer. Just the other day, I listened to Eddie introduce Banks to the rain-soaked crowd. Banks speaks for a bit on the recording, which is really cool. Rest in peace, Ernie Banks. I finally made a trade with the Dutch Card Guy recently. I sent him a 2013 Topps Mini Pink Clayton Kershaw and some other stuff and in return he sent me this 2014 A&G Mini Chris Davis. This is one of the mini exclusives that came out of rip cards. I tried looking it up on EBay, and didn't find any, but I'm told these carry a bit of a price tag. I was glad to be able to get one for my Davis PC. Thanks for the trade, Jeroen! I'm sure it's tough getting the cards you want in Europe, but I think it is really cool that our hobby extends across the ocean! 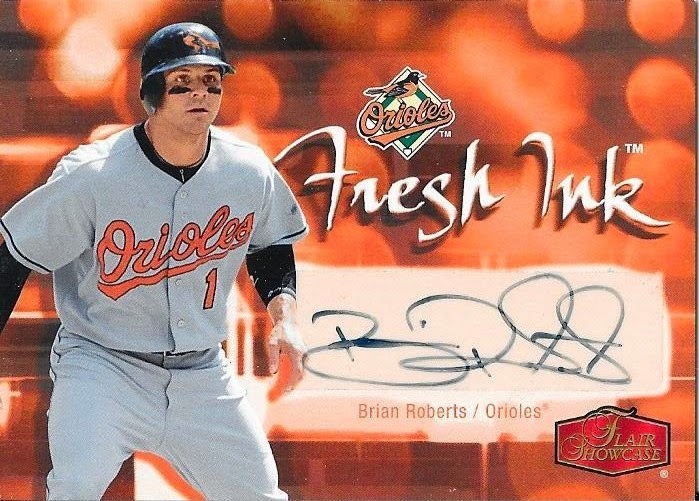 I got this Brian Roberts autographed card from 2006 Flair Showcase as a Christmas gift from my good buddy, Jet. I've been helping him this past year with advice, trades, set building, you name it. Jet is a really cool guy, and already has an amazing collection at such a young age. I guess it's safe to say, I'm a bit envious of the guy. I mean come on, he has a Hank Aaron rookie (part of his complete set of 1954 Topps). Jet always seeks me out for help, and has tole me before that he looks up to me. He just recently started collecting signed baseballs by Hall of Famers because I inspired him to do so. I don't really set out to inspire anyone. I just enjoy what I enjoy, and like to share it with you all. The fact that this kid from Oklahoma is inspired by anything I do it amazing to me. I'm happy to know that young folks out there want to enjoy this same hobby that I enjoy. So, thanks for this awesome Christmas present, my friend. I hope you, your mom, and the rest of your family had a great Christmas. You're a great guy, and definitely deserve it. Thanks, Jet! I was contacted via text message recently by my friend, Bruce, whom I hadn't talked to in a while. He had in his possession the above Jonah Hem 1/1 auto and was wondering if I would be interested. Since I kind of PC Heim, I was absolutely interested, and we hammered out a deal in a matter of minutes. We actually hammered out two deals because one of the key cards he wanted was misplaced (which I later found in the exact spot I had put it - long story), but once I got things set, we had a deal. This Heim auto is definitely an awesome 1/1. It comes from Panini Elite Extra Edition and is a die cut card with a sticker auto. It looks really awesome. I need to pick up a magnetic case for it soon. Bruce included a bunch of Orioles cards and had a Cal Ripken that I had never seen before, so this will make a nice addition to my Cal PC. 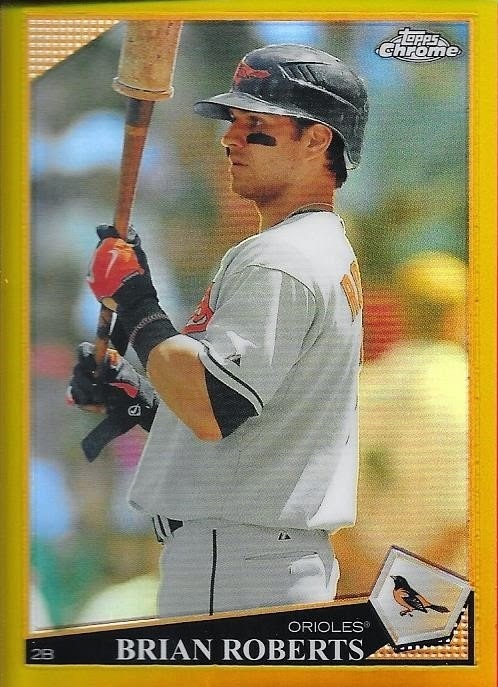 This is from 2002 Donruss. Speaking of Cal PC additions, Bruce included this graded 10 1993 Leaf Cal Ripken card. Why anyone would grade one of these is beyond me. I was talking over Skype with my buddy, Max, and his response was "Hey, I bet you that will be a unique piece in your PC...". He is absolutely right! 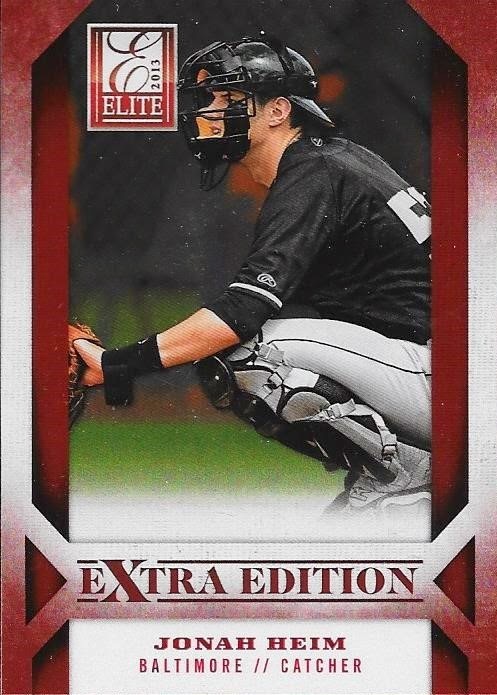 Bruce also included a few 2014 Topps Chrome cards that I needed for my set which leaves me needing only 7 to finish it. Thanks for the deal, Bruce! I'm glad we were able to agree to a deal after all this time, and I hope there is a lot less time between now and our next deal. 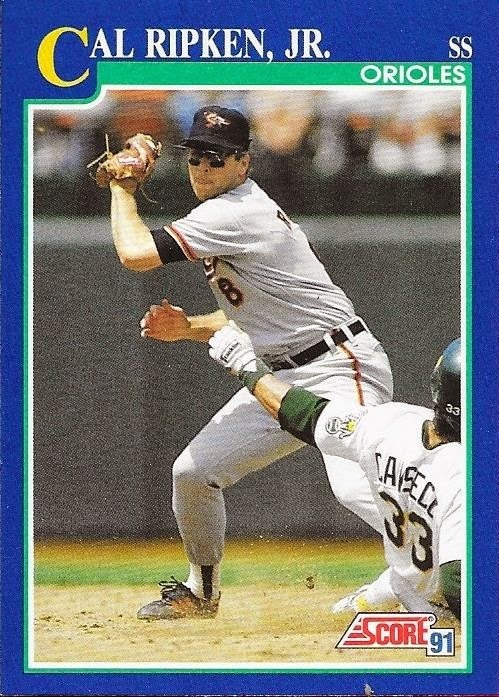 Not too long ago, I posted about completing my 1997 Topps set. The post is right here. The final card I needed for that set was sent to me in a Christmas package by my buddy from Instagram named Sam. I talk to two guys named Sam on Instagram, this one is the Mariners fan. Sam is one of the first few folks I dealt with on there, and I have been hooking him up with Mariners and Rangers cards for TTMs for a long time, now. Sam was really generous when he sent me that card to finish my 1997 set, but also included a few other cards that he thought I would like. 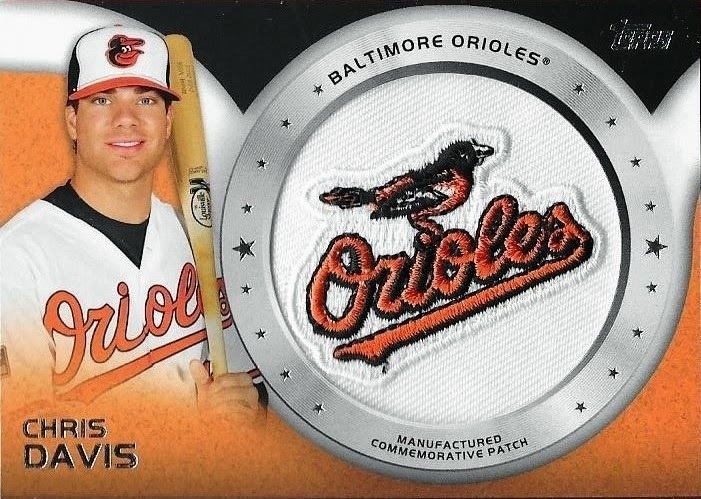 The above manufactured patch of Chris Davis is one that I had been looking for to put into my PC for a while since it came out. I think there are two versions of this patch, the above one and the cartoon bird. So, I'll still have to pick up a cartoon bird one, which shouldn't be too hard. Finally, I got this 2013 Topps Chrome LJ Hoes auto. I used to have one, but I sold it on COMC. I'm glad Sam sent me this one, because I feel like the auto is better, and I had seen Hoes play back when he was on the Keys. I won't be trading this one away, since my buddy was kind enough to give it to me. Thanks for the Christmas package, Sam! I really appreciate it! One of the guys that I met on Instagram, Jake, is probably one of the friends who I would consider was among the upper echelon of those friends. He is always a joy to talk to, and always comes to me when he needs collecting advice. I've spent a great deal of time helping him grow his collection, and he has repaid me with some great YouTube videos that have recounted the numerous care packages that I have sent him. You can check out Jake's YouTube page here. He's a great kid, and surprised me with a really awesome Christmas gift a few weeks ago. 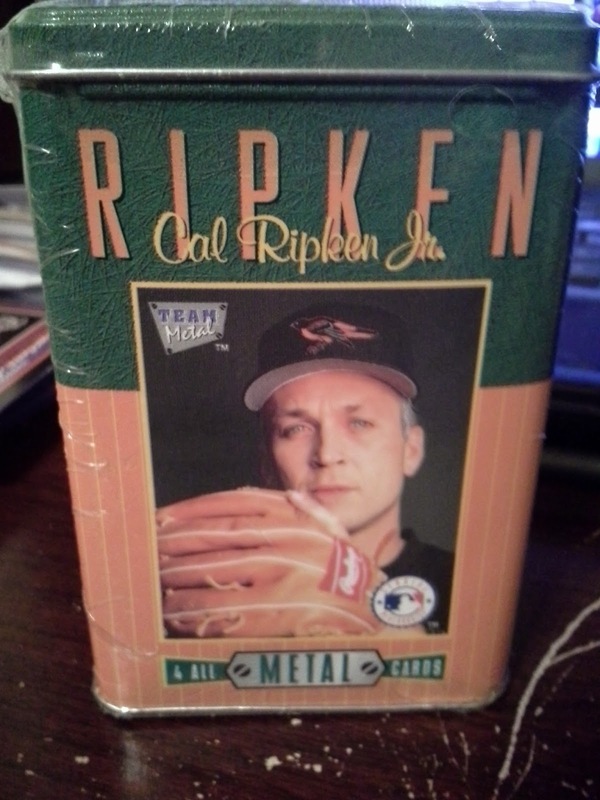 Jake sent me a few Orioles cards in a team bag, and this tin of 4 metal cards of Cal Ripken from 1995. 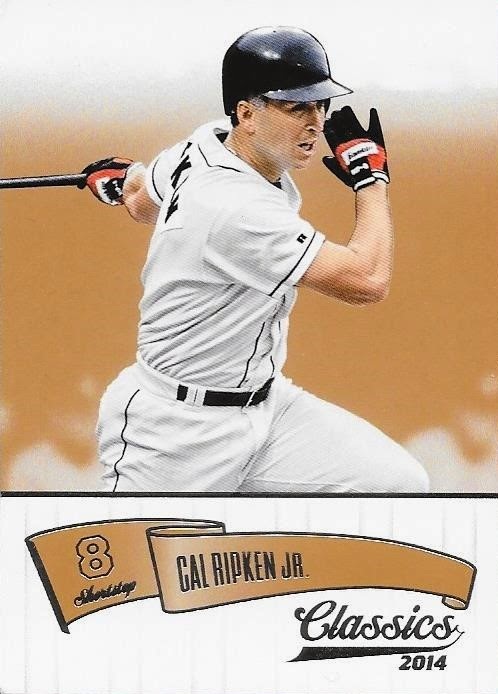 Over the life of my collection, I have received all kinds of Ripken stuff, especially from the mid-90s. Of all of the Ripken stuff that I have received, I have never seen these. Jake hit a home run, because, as you all know, it is terribly hard to come across Ripken stuff that I don't already have. The tin is factory sealed, and at this moment, I think I will leave it sealed. I might open it one day, but for now, I will leave it like this and remember that a really awesome guy gave it to me. I really appreciate him, and all of the friends I have made throughout all of the card community. It's guys like Jake who make me enjoy what I am doing here, and reactions like his are why I try my best to send good, free, care packages from time to time. One of my favorite things is to brighten these kids' days by helping them grow their collections. So, thanks so much for the Christmas gift, Jake. Also, Jake's birthday was yesterday, so head over to his YouTube page and wish my buddy a happy (belated) birthday! I picked up a few Chris Davis parallels recently when I got some money from my friend, Joey and some COMC sales from my friend, Noah. I searched for the right cards for a while, and was very happy with the ones I got. 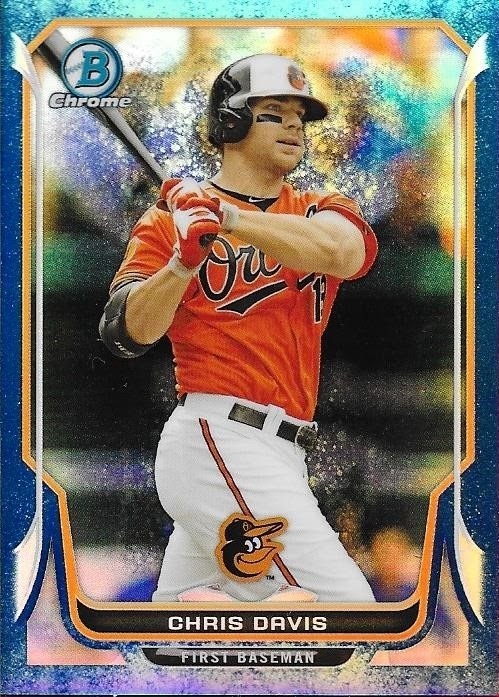 The above 2014 Bowman Chrome bubble parallel is probably one of my favorite color parallels that I have seen. The scan looks awesome, but it doesn't come close to doing the card justice. This card is numbered 99/99, so I ended up with an Ebay 1/1. OMG! I picked this blue refractor off of COMC. It is numbered 78/250 and looks awesome as well. It just doesn't compare to the bubble refractor, though. Back to my return from the money gotten from Joey, I got this silver paper parallel from 2014 Bowman that is numbered 58/75. This looks ok and all, but again, doesn't compare to that bubble refractor. 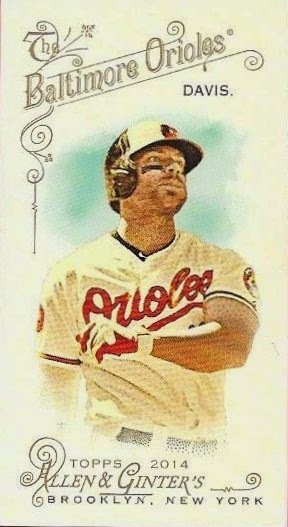 I do like this one, and I want to grab a few more of the parallels for the Bowman paper. As always, I'll "pursue" the rainbow, but I know getting the 1/1s will be hard. 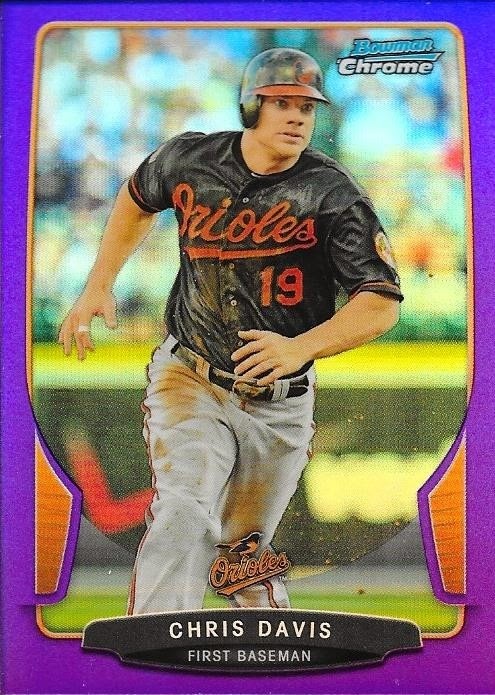 Finally, this 2013 Bowman Chrome purple refractor was a COMC pickup along with the blue. This was a product of me jumping on a card at a good price, then realizing "oops, it's a 2013, not a 2014..." Oh well. I still needed it, but I did think it was a 2014 until I got it in my possession. So, there you have it, I knocked off a bunch of Davis PC needs, and didn't spend any of my own money. Thanks for the purchases, Joey and Noah! My buddy Weston sent me a Christmas package recently that had a bunch of Orioles cards in it. The cards were great, but the thing about the package that stood out the most was the awesome purple bubble mailer that he sent it in. I opened the package over Skype with a few of the guys that I chat with, and each of them wanted to be the one that bubble mailer was shipped to next. You see, I recycle as much as I can. Partly because I work in environmental consulting, but mainly because bubble mailers cost money, and I'm cheap. So, why buy more when you can just re-use the ones sent to you. I haven't bought bubble mailers in years, so this has been working out for me pretty well. So, be on the lookout, who knows who the lucky person to get the purple mailer will be. 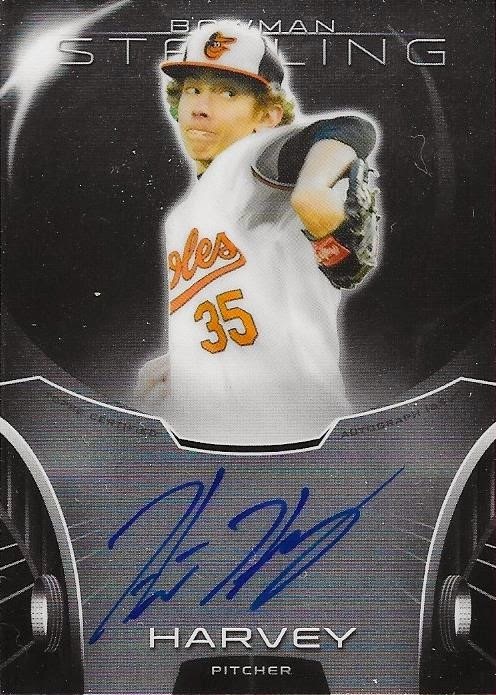 Anyway, Weston seems to be my hookup for Orioles prospects lately. 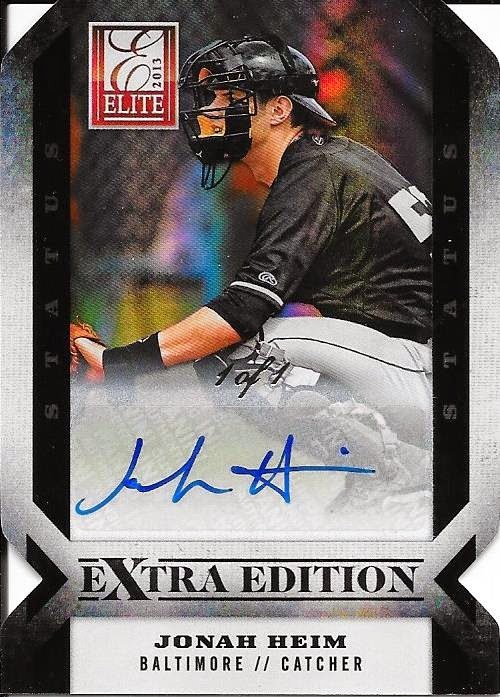 He sent me this great Panini Elite Extra Edition Jonah Heim card, which I really like. Heim is one of three catchers the Orioles drafted in the 2013 draft, and all three are pretty good prospects. The other two being Alex Murphy and Chance Sisco, of course. Speaking of Sisco, Weston sent me this card as well. It seems like I have gotten pretty much all of my Sisco cards (except for an auto I purchased off of COMC) from Weston. He must have a lot of luck pulling Sisco's cards. Thanks for the Christma gift, Weston! I really appreciate the thought and I'm always glad for our chats. I gathered together some Reds hits and other cards for my friend, Sam L. who runs the YouTube channel: Samthecardcollector (that's his Instagram handle as well). He's a really nice guy, and we have already completed a couple trades. 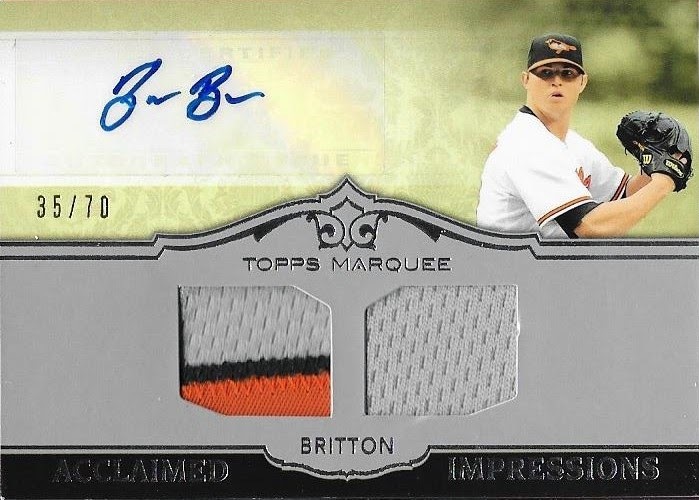 Sam hooked me up with this awesome Zach Britton relic/patch/auto from 2011 Topps Marquee. I was amazed that Sam was ok with letting this card go. I really appreciated his generosity. Please, everyone, check out Sam's YouTube page, he needs more followers and is a great guy. Thanks again, Sam! I'm not usually lucky on Ebay when it comes to straight up stealing things like I see some folks doing. I get good deals, but it is rare for me to get one that I would consider an absolute steal. 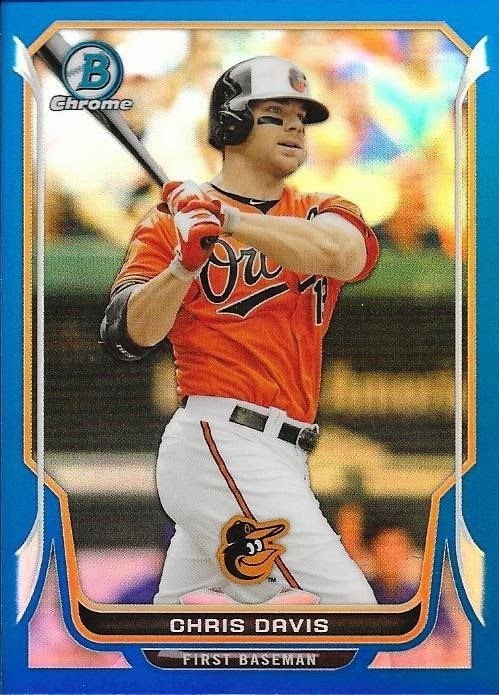 After I sold my buddy, Joey, a baseball recently, I used the money for some Chris Davis PC needs. 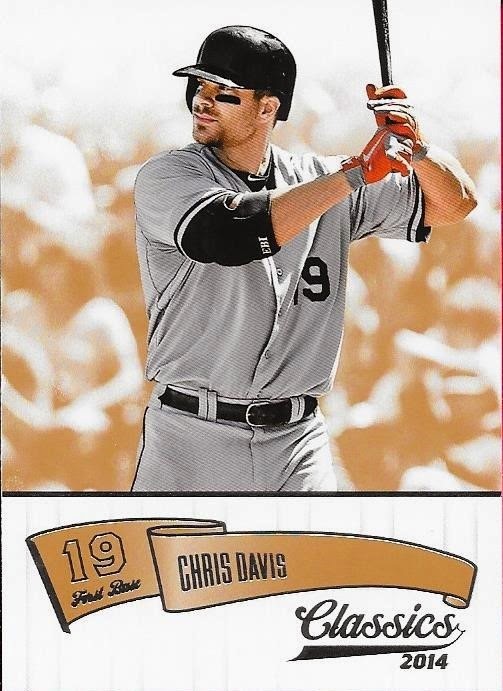 I had a little less than $5.00 left over from that buying spree and happened upon the above Chris Davis booklet card from 2014 National Treasures. It was at $2.99 + $2.25 shipping with about an hour to go. I figured that I would take a shot on it, so I bid $6.00. I ended up winning the card for $5.74 plus the shipping. With what I had left over from Joey, I ended up paying out of pocket $3.81 for this booklet card. To me, that's a steal! The card is numbered 92/99 and looks great. Yeah, I wish it had a patch on it, but I'm ok with the gray swatch. Especially with the price I paid! My "to be blogged" pile is pretty huge at the moment. So much so, it is mid-January, and I still haven't shown off all of my Christmas gifts yet. I'm getting there, but I don't want to dump them all into one post; I want to try to give each person/package their own post and truly do the gifts justice. It is never the quantity or "value" of the gifts you receive that is important, but the thought itself that should hold meaning. That being said, the best part of this gift might not have been the awesome cards that I scanned, but the letter that was included along with them. You see, my good friend, James, and I have been trading for a year now. He was the second person I made a successful deal with on Instagram, and we have been good friends ever since. Of all of the people on Instagram that I consider friends, James writes me the best notes and includes them in each package. Sometimes, the notes are my favorite part of the deal. Anyway, along with another great letter, James also included some really cool cards that I wasn't expecting. 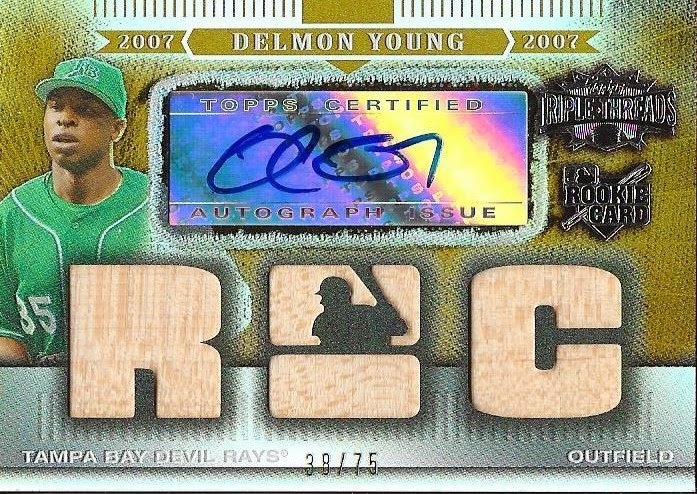 The above Delmon Young card is a fine example. Young forever endeared himself to O's fans on October 3 when he hit the three-run double to put the O's ahead of the Tigers in ALDS Game 2. The fact that I was there makes it all that much more special. So, James giving me this card and adding the facts about Young, I will slab this card in a mag and will never let it go from my collection. 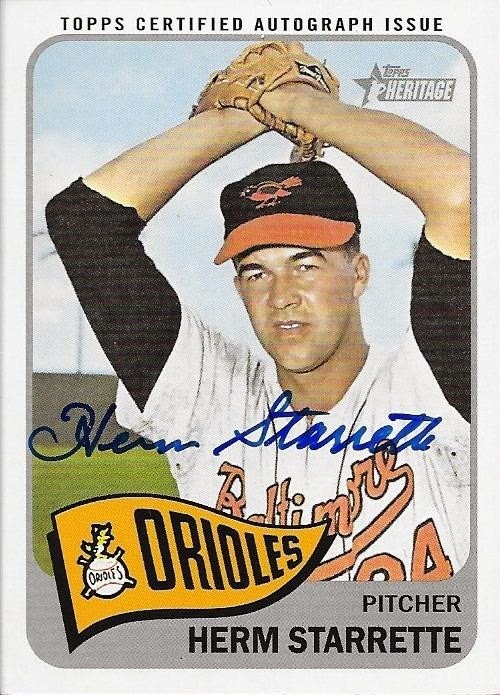 Another card James sent was this on-card auto of Herm Starrette from 2014 Heritage. It was really funny that he sent me this card, because I think it was offered to me by three different guys in trades, and I never took the bait. I wanted the card, I just never felt like I had enough to offer for it. Thankfully, my patience (and James's generosity) paid off, and I now own the card. Thanks so much for the Christmas package, James. I was really happy to open it, and I'm sorry it took me so long to post it. I hope the post has done the gift justice, because I appreciate everything you do! 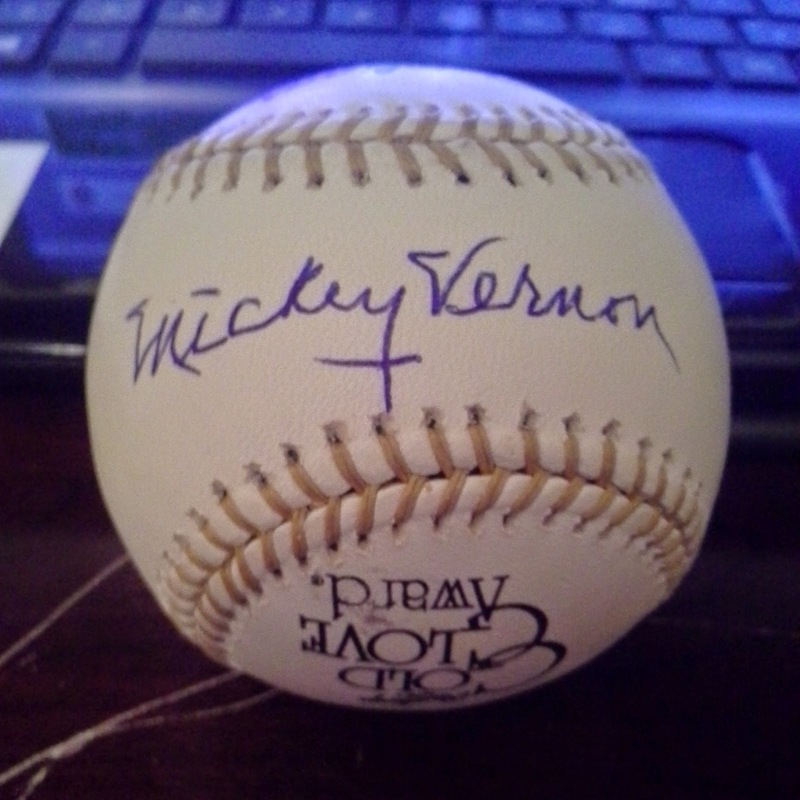 Along with the Mickey Vernon baseball that I got yesterday from Michael, I also got my Christmas gifts from him. The major pieces from the package are shown here. What I haven't shown, though, was a good bit of stuff as well. Inside the box were two signed baseballs (Pedro Viola and Chris Michalak), a game used baseball from one of Michael's baseball games, a Derek Jeter Turn 2 coin that I won in an Instagram contest, a few assorted baseball cards, 30 cards from 2012 Topps Update to help me work on that set and three t-shirts (one of which was signed by Jim Gentile). Those in themselves were huge pieces that I really appreciated from him. Michael helped me out tremendously by finding three cards that I needed for my 1948 Bowman set. As you can see, the condition on all of them is really good. I actually appreciated Michael's picky way with cards, because these really turned out great. 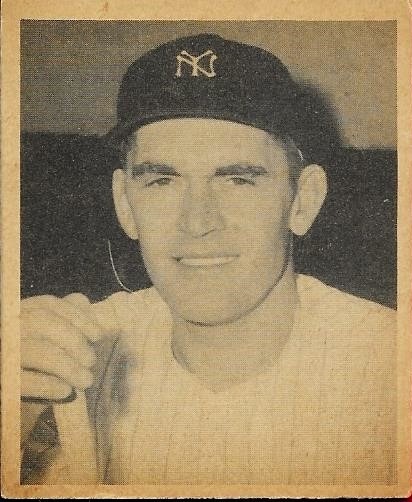 The above card from 1948 Bowman is card number 11, Johnny Lindell. 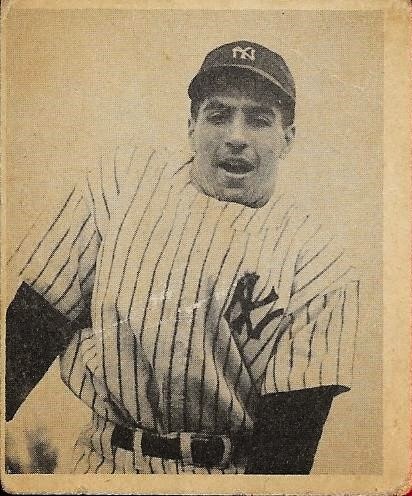 This one is card number 39, Augie Galan. With the three cards from Michael, I now only need 10 cards to complete this set. Not too bad, and I believe I can finish this sometime this year. 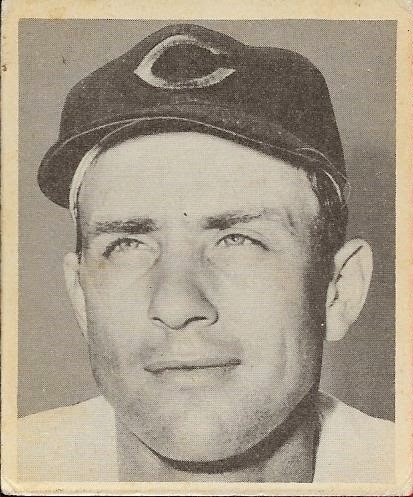 This one is card number 44, Johnny Wyrostek. I really appreciated Michael hooking me up with these cards. He didn't have to, but chose to try to push me further along with this set, and now he has me really close to the finish line! Michael wasn't done with the '48s, though. 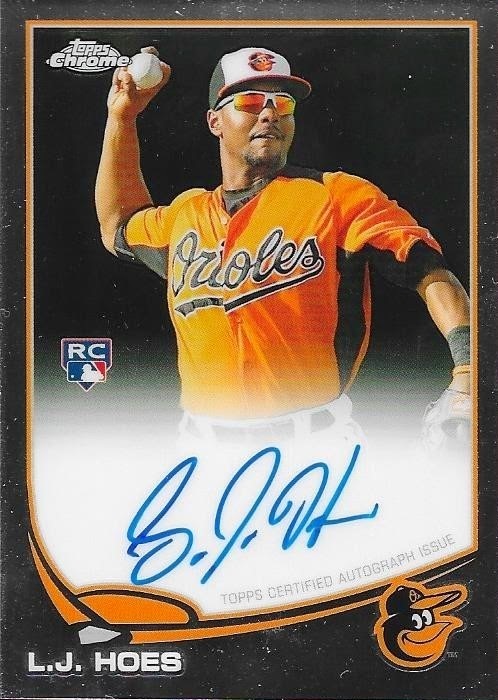 He knocked out an Orioles PC card that made it onto my Top 10 Wishlist for 2015. 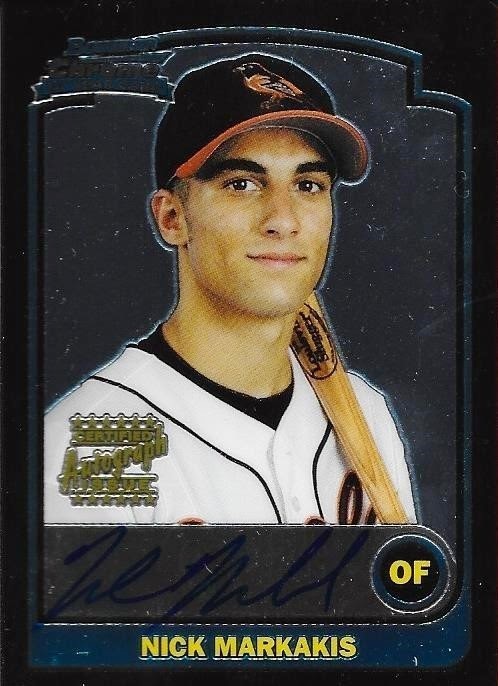 I had been looking for this 2003 Bowman Chrome RC auto of Nick Markakis for some time, now, and let a few opportunities to pick it up pass me by. I finally have it in my PC, which is bittersweet, since Nick is now a Brave. 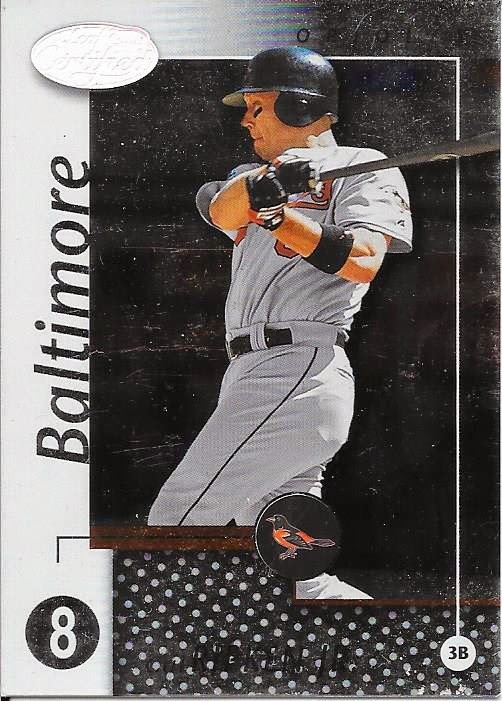 I will always love Nick as an Oriole, so this card will be untouchable in my PC. Michael has always come through for me. I might not tell him every day how much his friendship is appreciated, but I sure hope he knows. He went above and beyond with these Christmas gifts, and my gratitude cannot be overstated. I made a deal recently with my good friend, Michael, when I purchased this baseball off of him a few weeks before my wife's surgery (back when I had money). The ball is signed by Mickey Vernon and is a Rawlings Gold Glove baseball. Vernon (b. 1918 - d. 2008) never actually won a Gold Glove award during his playing days (1939 to 1943 and 1946 to 1960). He played for the Senators, Indians, Red Sox, Braves and Pirates, the latter during their championship season in 1960. Vernon never played in the post season. He was a two-time batting champ (1946 - .353; 1953 - .337) and finished as high as 3rd in the AL MVP voting (1953). Vernon closed his career with 2,495 hits, 172 home runs and a career average of .286. One would think that he would have gotten more support for the Hall of Fame, had he not missed two seasons to World War II. He was on the ballot for 15 years and got no more than 24.9% of the vote (in his final year on the ballot). Thanks for the deal, Michael. I was happy to add this ball to my collection, especially since Vernon was a former batting champ. I completed a trade with my friend, Blaine, on Instagram last week when he made me an offer I couldn't refuse for my 1962 Topps Mickey Mantle. I initially wasn't interested in moving the Mantle at all, but Blaine persisted and we finally struck a deal. 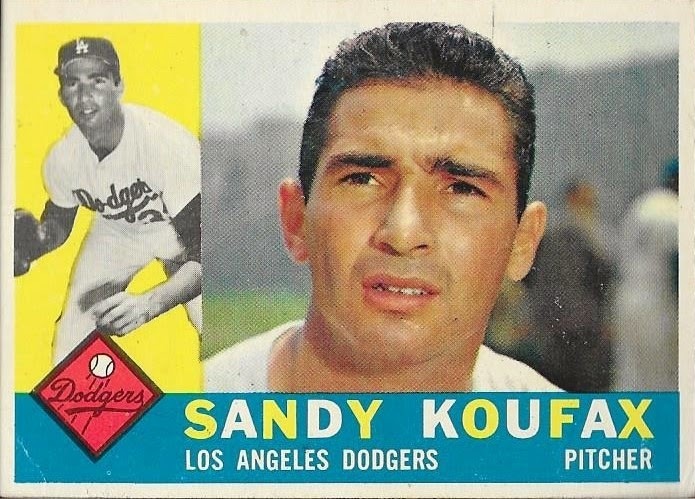 I got a god bit of cash, and also this nice 1960 Topps Sandy Koufax. I like the 1960 set, almost as much as I like the '62 set. So, this was a main component to the deal. 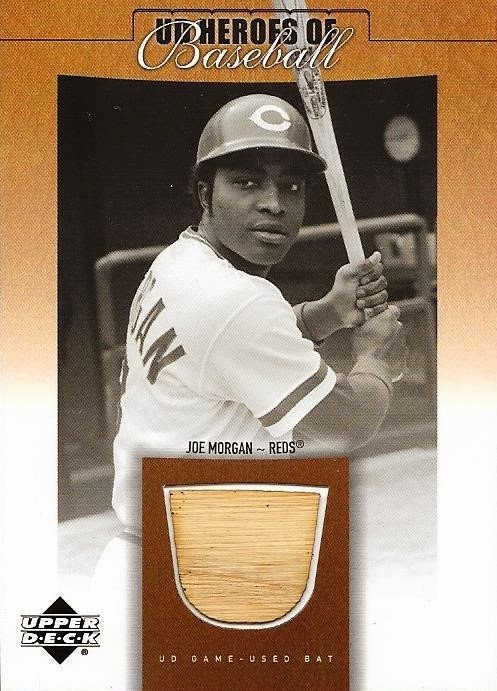 Once we had an agreement on the amount of money and the Koufax in place, Blaine helped sweeten the deal by adding this nice Joe Morgan relic to the pile. Since Chris and I met Morgan a few years ago at the National, I have been picking up some of his cards here and there, so I was happy to add this one. 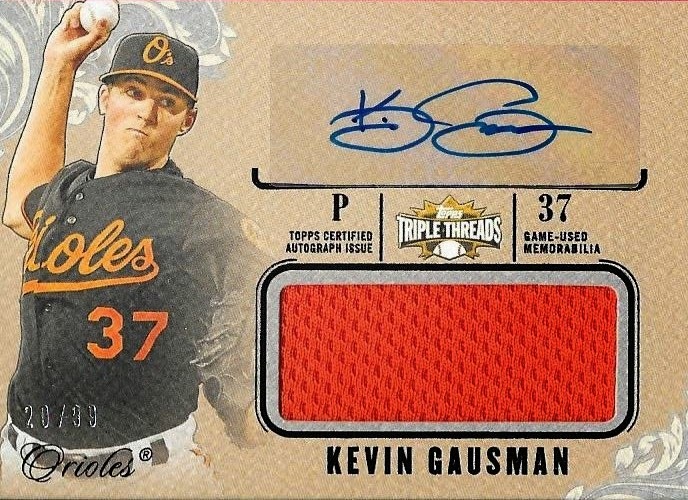 The final piece that sealed the deal was this Triple Threads relic/auto of Kevin Gausman. I really liked how this card looked and when I got it in person, I liked it even more. It has a matte finish to it, that I think really works well. I also got a surprise when I opened the package from Blaine. 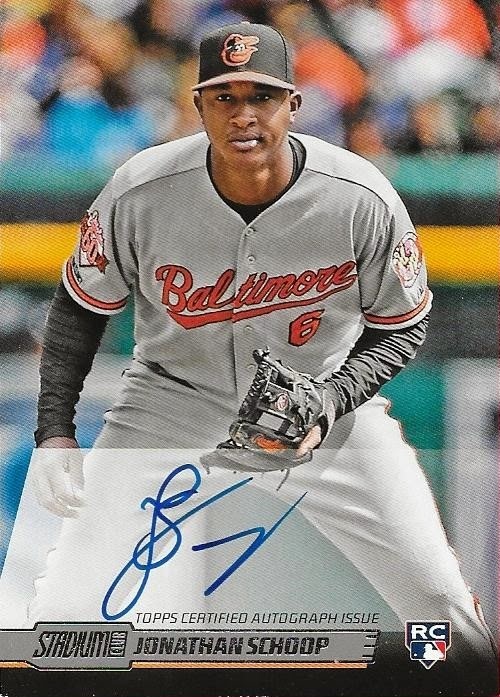 He was just a little short on the cash that we agreed to, so he added this Schoop auto from Stadium Club. I didn't mind getting this instead, so I appreciated the gesture. So, thanks for the deal, Blaine. I guess the old saying is true, everything has a price! I figured to upgrade that Mantle at some point, anyway. It was on the lower end of the grading scale, and I wanted to try to find another one at the price I paid, in better condition, and I feel like I can do that. I sold an extra signed ball that I had to my buddy Joey last week. The money that he sent via PayPal went a long way toward easing a dry spell I have had when it comes to buying cards. With my wife being out of work, still, due to her foot surgery, my card buying had been strictly limited to next to nothing. I have sold a few things recently, and that has brought me enough money to purchase my Series 1 boxes that I have ordered. It's really nice when your hobby can fund itself. So, when Joey paid me for the ball, I decided that I should turn the money into some PC needs. I had seen quite a few of the new color parallels from Bowman Chrome and Bowman base and I really like them. 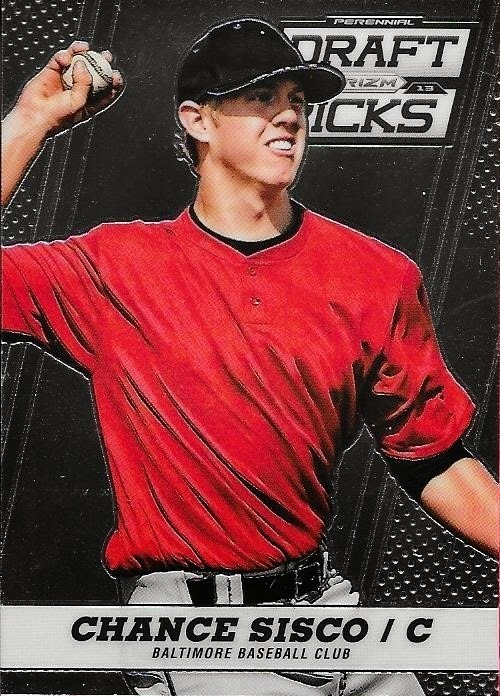 I spent a few hours on Skype with the guys (Scott, Max, Caleb and Noah) and during our chats, I flipped around Ebay and priced a bunch of the different Davis parallels. 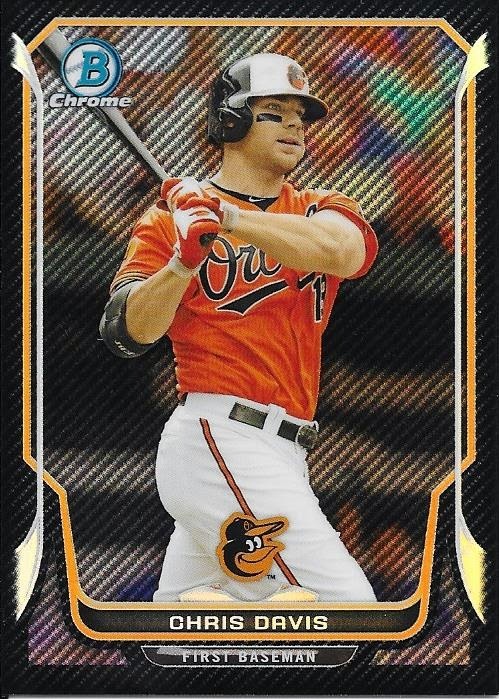 The first card to come in from that buying session was this 2014 Bowman Chrome Chris Davis carbon fiber parallel. I have always liked their "wave" and "ice" parallels, so when I saw this one, I instantly loved it. I hesitated to put it into my cart, however, because the price tag (at $19.99 shipped) almost wiped out my entire budget. After cruising Ebay a little more and adding a few cheaper parallels, I realized that I still had enough for the carbon fiber one. So, I added it to my cart and made my purchase. The best part was, I shopped smartly, so, I ended up with nearly $5.00 left in my PayPal (enough for an Ebay steal that will be shown in a later post). So, this carbon fiber parallel looks really awesome and is numbered 5/10. That's even better! Check back in a few days to see the other parallels that I picked up. In the meantime, stay warm out there! I made a trade recently with a new trade partner through the blogosphere. His name is Tim, and his blog is "I Love The Smell of Cardboard In The Morning," I recommend you check it out. Tim approached me after taking a look at my needs list for 2014 Topps Chrome. Tim knocked a bunch of those out, 15 to be exact. It's the extra stuff that Tim included that really blew me away. Beginning with the above Brooks Robinson auto, and continuing on with the stuff I'll show below, Tim went above and beyond! 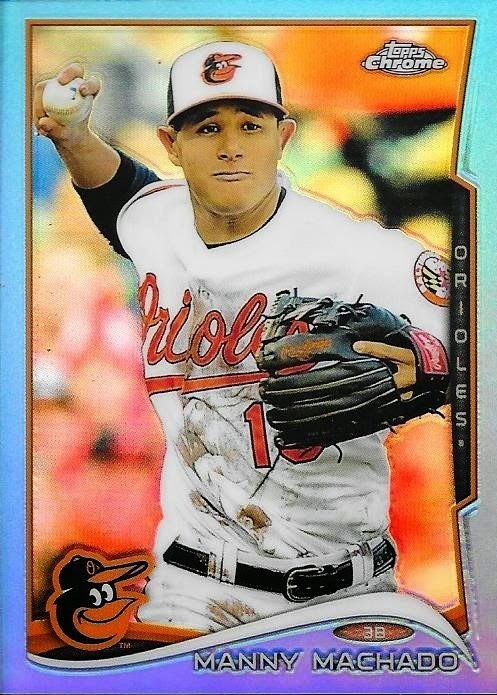 I love the color parallels, as always, and this blue 2014 Chrome Manny Machado doesn't disappoint. Numbered 110/199, this is new to my collection. 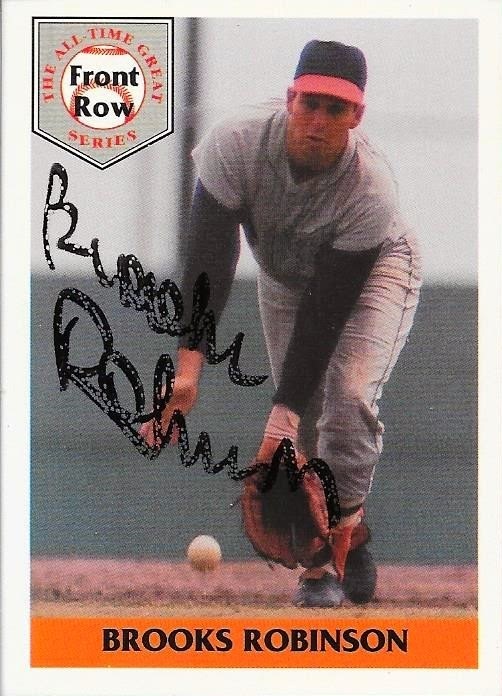 I haven't been through my Roberts PC recently, so I need to see if I had this one yet, or not, but I'm still glad to have it. Any time you can add a gold parallel to your PC is a good day. This one is numbered 39/50. 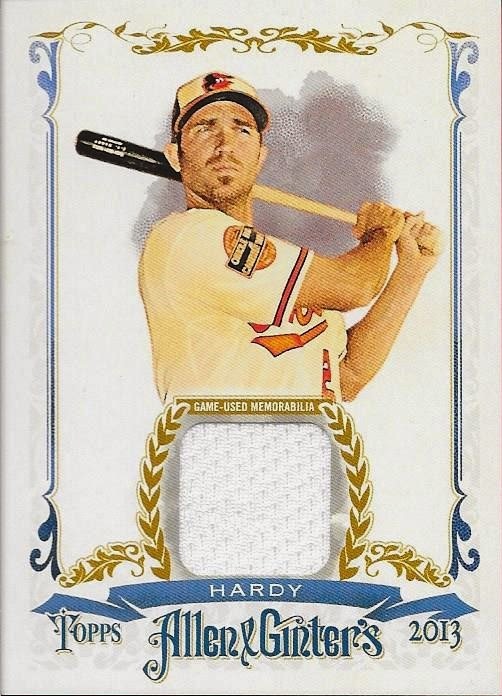 Finally, Tim included this JJ Hardy relic from 2013 Ginter. I don't have very many JJ cards as it is, so this one is especially welcome. JJ has become a great player for the O's and I'm very glad that he signed his extension this offseason. Thanks so much for the deal, Tim. I'mm continue to keep an eye out for cards for you, so we can do this again! She wasn't aware of it, but my grandma knocked one of the cards off of my Top 10 list with the annual cash award she gave me for Christmas. To make things easier on her, since I have a huge family, she gives the adult grandkids cash instead of gifts. This works out well for me, because I can take what she gives me and apply it to something I really want and wouldn't buy for myself. So, in that vein, I went ahead and watched a few auctions on Ebay until I found two that were at reasonable prices, and were ending by last weekend. I bid on the first of the two, and held on til the end to take home this awesome card! 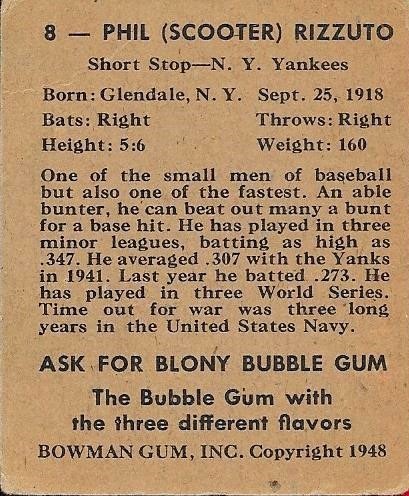 This was the last big RC that I needed for my 1948 Bowman set. Knocking card #8 off of the 1948 Bowman set checklist leaves me with 13 cards remaining out of the 48 issued for the set. So, thanks for helping me get this awesome card, Grandma! I always appreciate the Christmas gifts, and everything else you do, all year round. Oh, and, just so everyone knows, it's Grandma's birthday today. I won't reveal her age, since she is a classy lady, but I do wish her a birthday, nonetheless! Holiday Package From Scott F.
I received a holiday package recently from my friend from Facebook and Instagram (and Skype and Kik), Scott F. He sent me a nice stack of Orioles cards, a lot of which I needed. 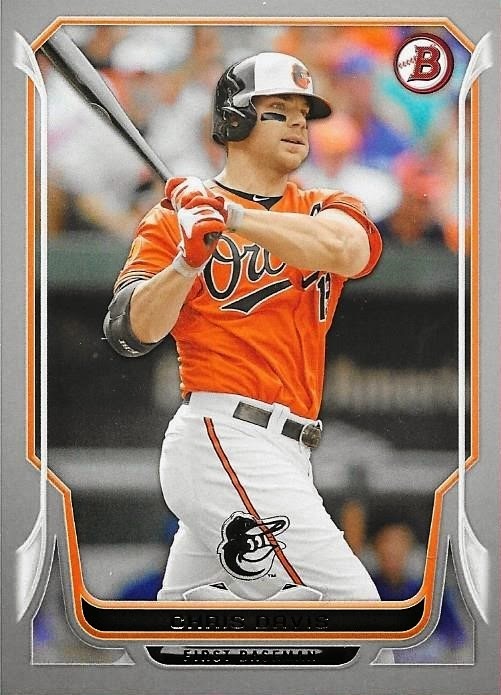 One of them was the above 2014 Panini Classics Chris Davis. I like the design of this set and I actually hadn't even heard about it until I opened Scott's package. 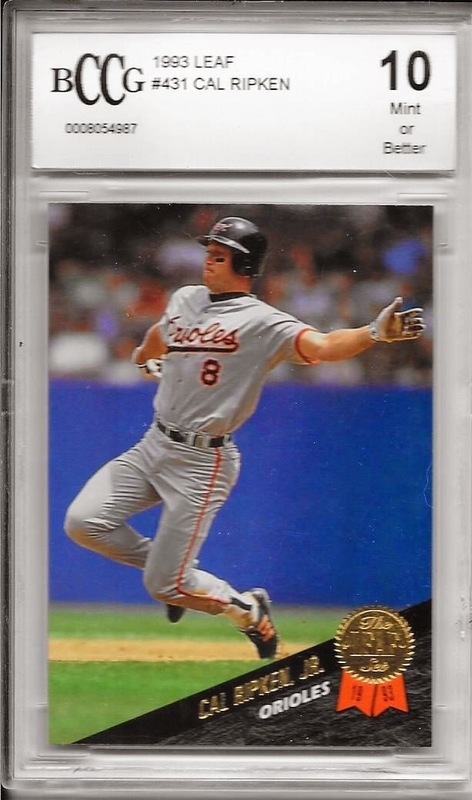 So, since I hadn't even heard about this set, Scott pulled off the rare feat of sending me a Cal Ripken card that I didn't already have in my PC. Thanks for this also, Scott! So, thanks for the holiday package, Scott! I really appreciate the cards, I hope you liked yours as well! I completed a trade on Instagram the other day when I sent a guy named Michael (who's Instagram name is sportscards_infinity) a 2014 Bowman Gold Refractor auto of Daniel McGrath in exchange for the above Chris Davis 2013 Topps printing plate. This is the yellow plate. I was glad to add this to my collection, which now has 13 different versions. I still, obviously, need the 1/1 platinum parallel. I always enjoy getting the printing plates. One of these days, I need to count up how many plates I have, but I know I have a bunch. With today's announcement of the 2015 Hall of Fame inductees, I now can add my John Smoltz ball to my Hall of Fame signed baseball collection as ball #108. Smoltz got in with 82.9% of the vote on his first ballot. Three other former players are going to be joining him on July 26 (happy birthday, Drew!) as Randy Johnson (97.3%), Pedro Martinez (91.1%) and Craig Biggio (82.7%) were elected with more than the 75% vote requirement. Johnson and Martinez were also first-timers on the ballot. Mike Piazza missed election by only 5.1%, so it stands to reason that he would make the jump next year and go in with, at the very least, Ken Griffey, Jr.
Jeff Bagwell also fared decently with 55.7%, a jump of 1.4%. I was monitoring his progress closely, since I have a signed baseball of his, also. So, welcome to the Hall! I now have 108 Hall of Fame signed baseballs!